The first thing you need to do is to create a Google Analytics Account for your domain. 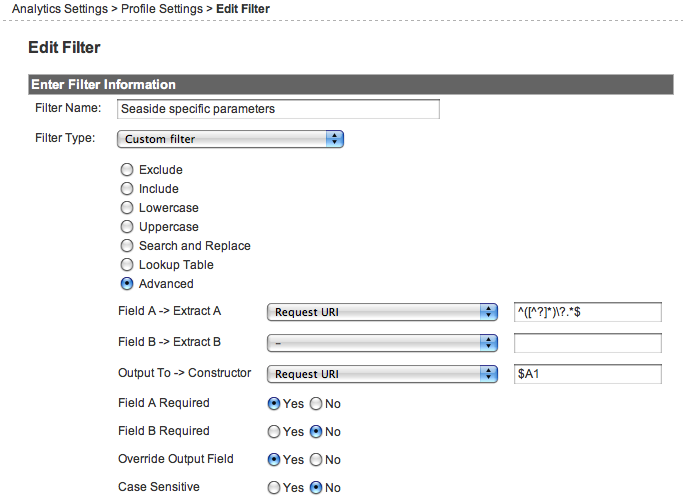 Access the settings of /environment/googleanalytics from your PIer. Paste in the uacct field the number that you just copied. Note: This is not necessary with recent versions, as Pier includes information about the canonical URL automatically with every page. To make Google Analytics deal better with the dynamic parameters of Seaside (_s and _k), you should tell Google Analytics to disregard them. For this, edit your Google Analytics account, and in the Filters area, choose Add Filter and set it like in the picture below.